I was once like you... Oblivious to the hazelnut spread called Nutella. Not knowing what true joy tasted like. Never partaking of this heavenly chocolate-y, goodness. It wasn't until I joined my husband's family that they took me by the hand and showed me the way. Okay, but seriously, the stuff is good. I instagramed and facebooked a photo of these bad boys and got immediate requests for the recipe. Am I surprised? No. I mean, just look at it! Preheat oven to 325 degrees F. Butter an 8x8 baking pan then line with parchment paper (the butter helps the parchment paper stay in place). Make sure the paper is pressed into the corners. 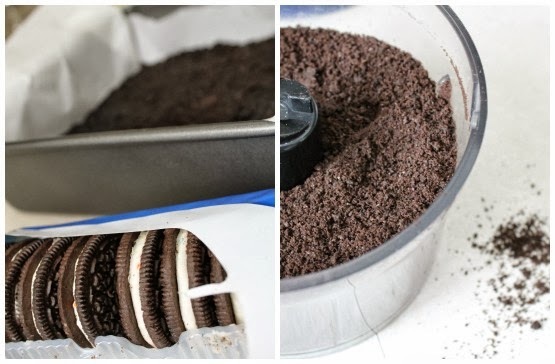 De-cream the Oreos and place in food processor or ziplock bag to crush. Add in the melted butter with the crushed Oreos and pulse until they are combined. Press the Oreo mixture evenly into the bottom of the baking pan and bake the crust in the oven until set, for about 12 minutes. Set aside to cool. Mix together cream cheese, eggs, sugar, 1/4 c. heavy cream, and vanilla. 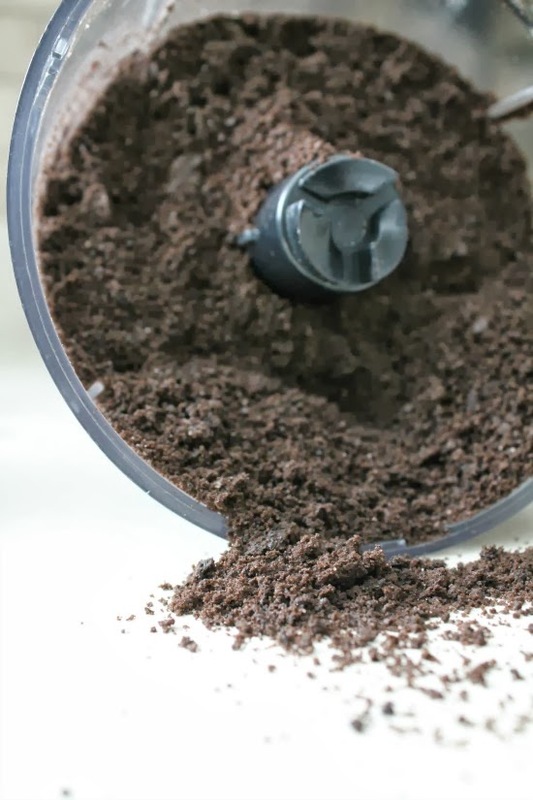 Mix until smooth (this works really well in a food processor). Put 2/3 of the cream cheese mixture in a bowl and set aside. 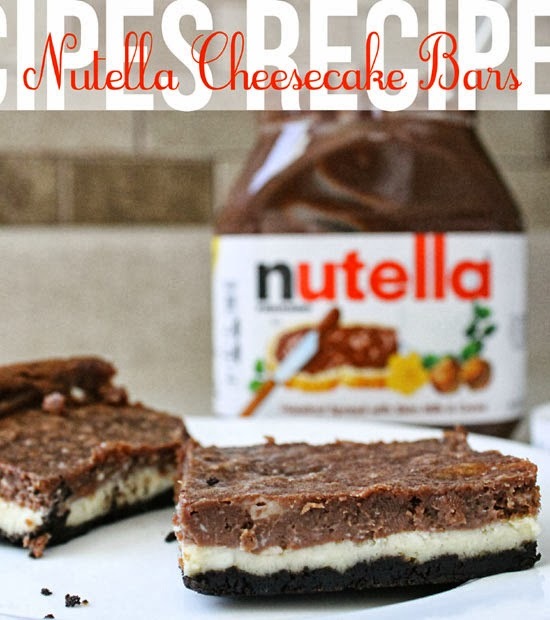 Add the Nutella and 1 Tbsp. of heavy cream to the remaining 1/3 c. of cream cheese mixture, and mix until smooth. Make sure the Oreo crust is completely cool, then carefully spread the cream cheese mixture evenly on top of the crust. 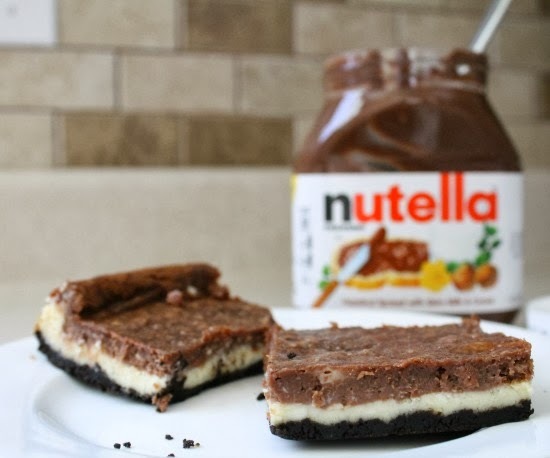 Then carefully spread the Nutella cream cheese mixture on top of that evenly. Bake on the center rack of your oven for about 35 minutes or until the center jiggles slightly. Remove from the oven and cool completely on a cooling rack. Refrigerate for at least 3 hours before eating. When ready to serve, cut into 16 squares and lift the bars from the baking pan. They will easily pull off of the parchment paper. Serves 16. This looks super delicious.. Going to share this! And oh-my-goodness are they simply delectable! Thanks!